In an earlier issue, I discussed Brooklyn, focusing on the downtown area. Now I’d like to discuss the Williamsburg area of Brooklyn. In recent years, Williamsburg has become popular with aspiring artists; one might compare it to SoHo in 1970, or Greenwich Village in 1950. If you want a taste of artsy Williamsburg, walk down Bedford Ave., between North 5th Street and North 10th Street. 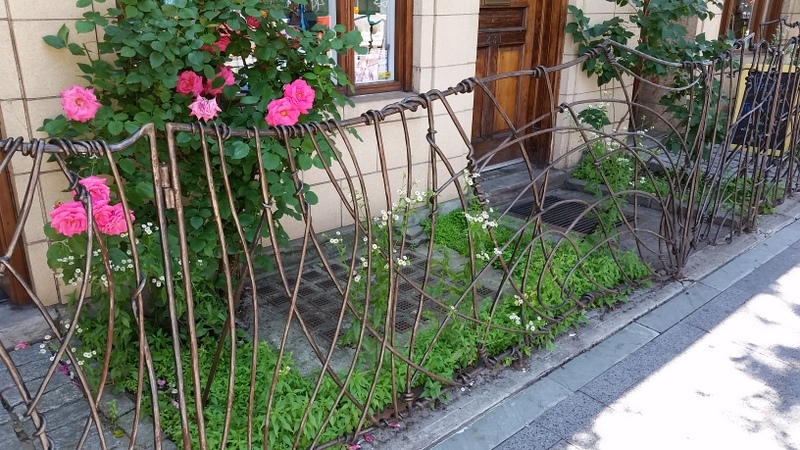 A hand-made fence on Bedford Ave. in Williamsburg. Williamsburg artists seem to be fond of metal. 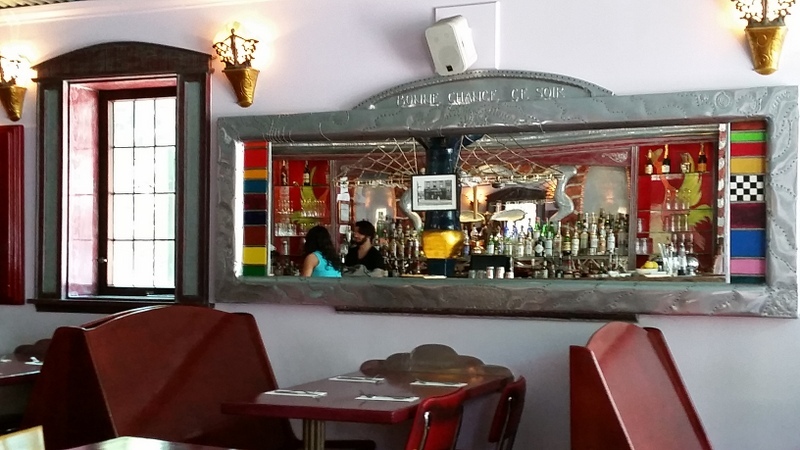 Trix, a restaurant on Bedford Ave.
Everything is hand-made, metal everywhere, rivets innumerable. 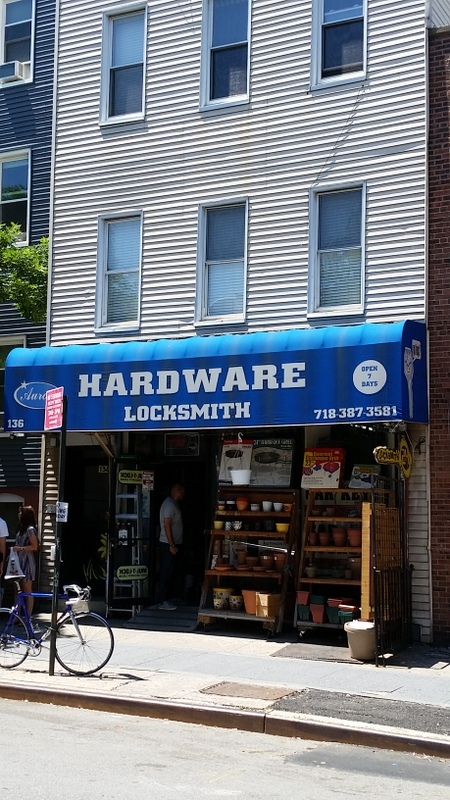 Bedford Ave. still has some stores that hark back to a grittier time. 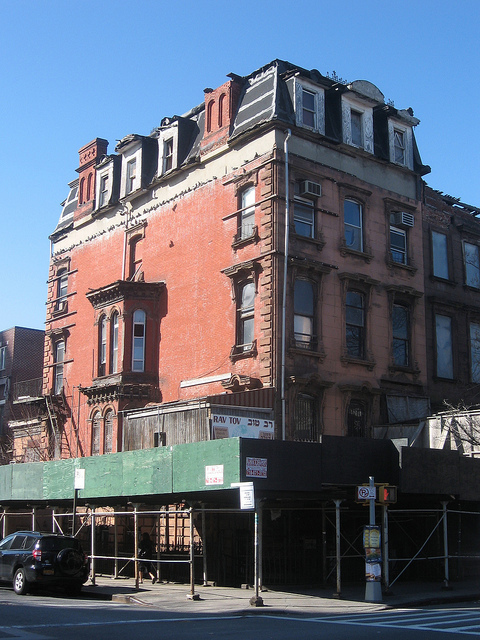 “This Victorian Second Empire brownstone was once the home of Grand Rabbi Josel Teitelbaum (the Rebbe), who led the bulk of the Hasidim from Europe to Williamsburg after World War II. When the native Hungarian rabbi passed away in 1979 at the age of 92 a reported 100,000 Jews attended his funeral.”2 This house is marked with a Q on my map. After World War II, when the Hasidim began coming to South Williamsburg in large numbers, there was friction between the Hasidim and Orthodox Jews. This is depicted by novelist Chaim Potok in The Chosen, which was published in 1967 and enjoyed both critical acclaim and broad popularity. In 1981, The Chosen was made into a movie of the same name. The Chosen was Potok’s first novel, and remains his most well-regarded novel. Like D. H. Lawrence and other writers, Potok was a painter as well as writer. He wrote an autobiographical novel, My Name Is Asher Lev, about a Hasidic boy who wants to be a painter and clashes with his parents. Potok read the Western classics in the library, away from the disapproving eyes of his parents. He was influenced by Evelyn Waugh’s Brideshead Revisited. Another well-known novel that’s set in Williamsburg is Betty Smith’s A Tree Grows in Brooklyn, which takes place in the 1910s. Orthodox Jews had begun coming to Williamsburg from the Lower East Side after the construction of the Williamsburg Bridge in 1903; the New York Tribune called the bridge “The Jews’ Highway.” Williamsburg was attractive to Jews living in the crowded tenements of the Lower East Side. 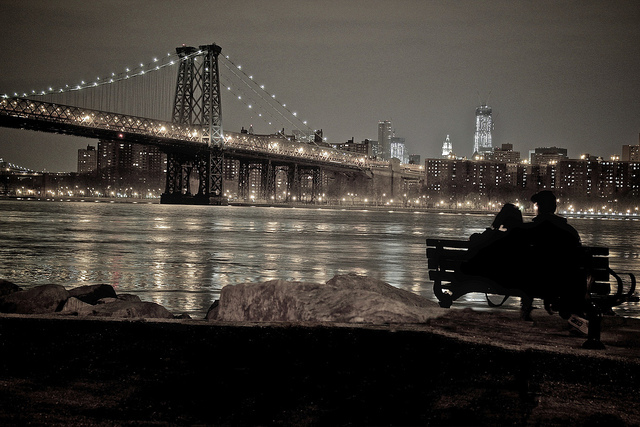 In recent decades, there has been an influx of Latinos into Williamsburg. Many Latinos settled in central Williamsburg, between the artsy northern section and the Hasidic southern section. I’ve mapped out a tour of Williamsburg, based on Doug Gelbert’s tour. 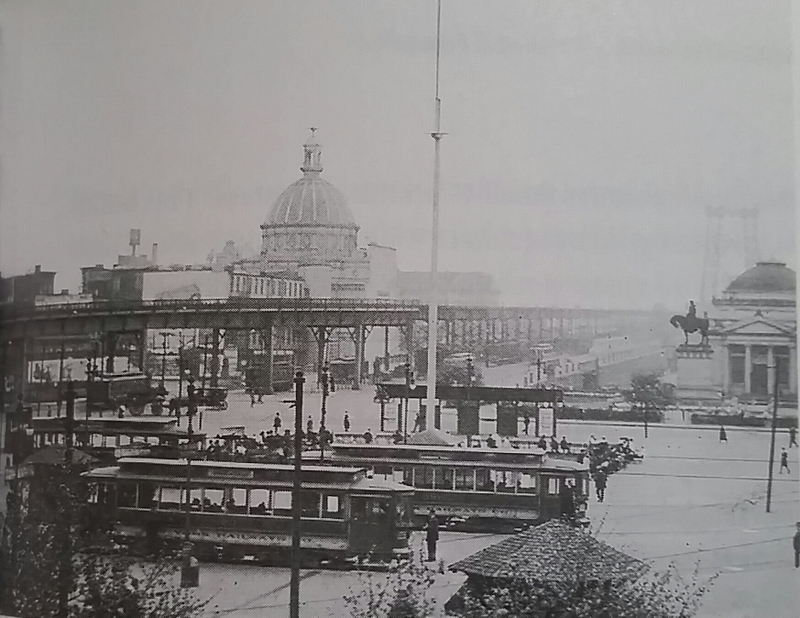 This picture from the 1920s shows the large dome of the Williamsburgh Savings Bank (marked with a green M on my map); the bank is one of the neighborhood’s most conspicuous buildings. 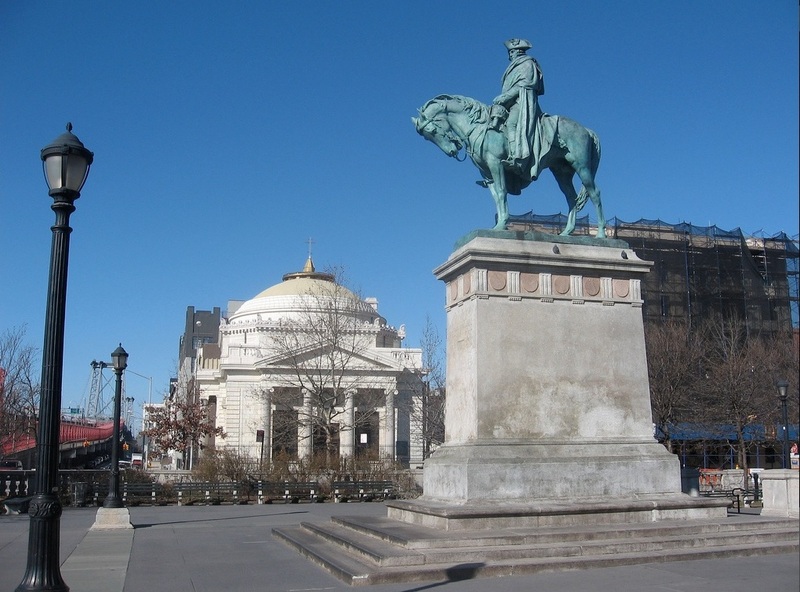 On the right of the picture is the statue of Washington and the Ukrainian Church; in the background is the Williamsburg Bridge. Like the Washington statue, the church dates from 1906. It was originally built as a bank. The style is Beaux-Arts. 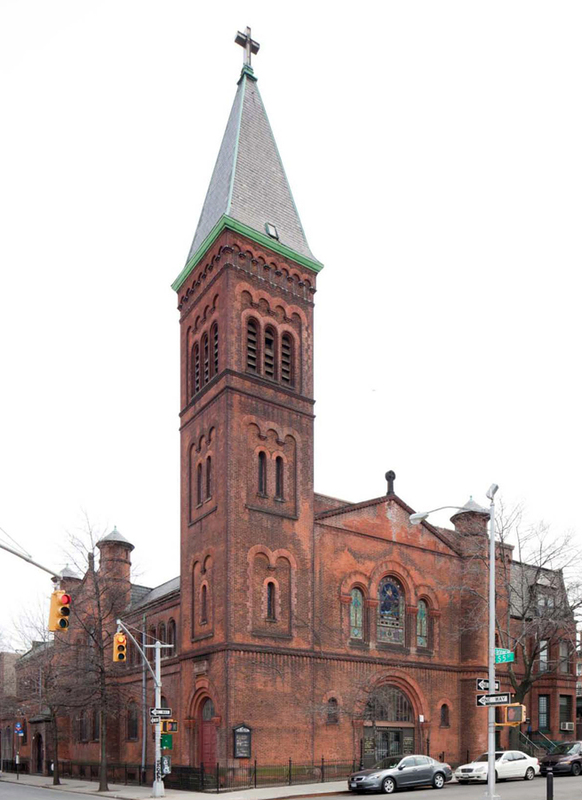 “A crisply detailed and lovingly maintained Lombardian Romanesque basilica by Franz J. Berlenbach, Jr. from 1870.” 255 North 5th Street. More info. Like the church across the street, the convent was designed by Franz Berlenbach. The style is Romanesque Revival. 56-64 Havemeyer Street. More info. 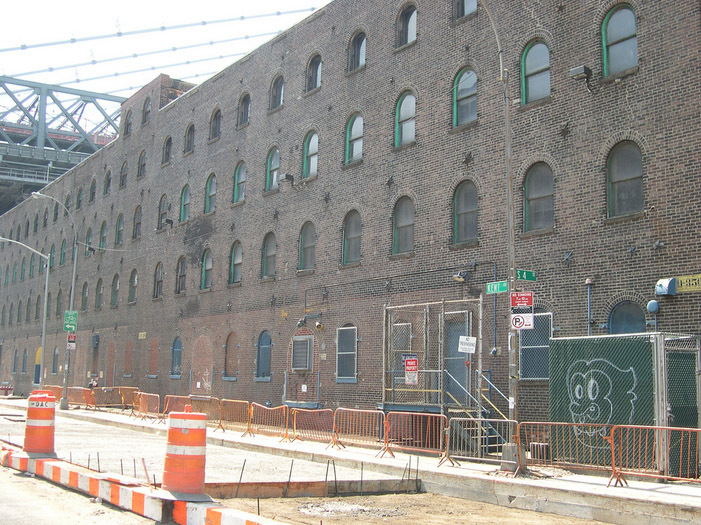 Around 1870, Berlenbach was part of a large German community in Williamsburg. 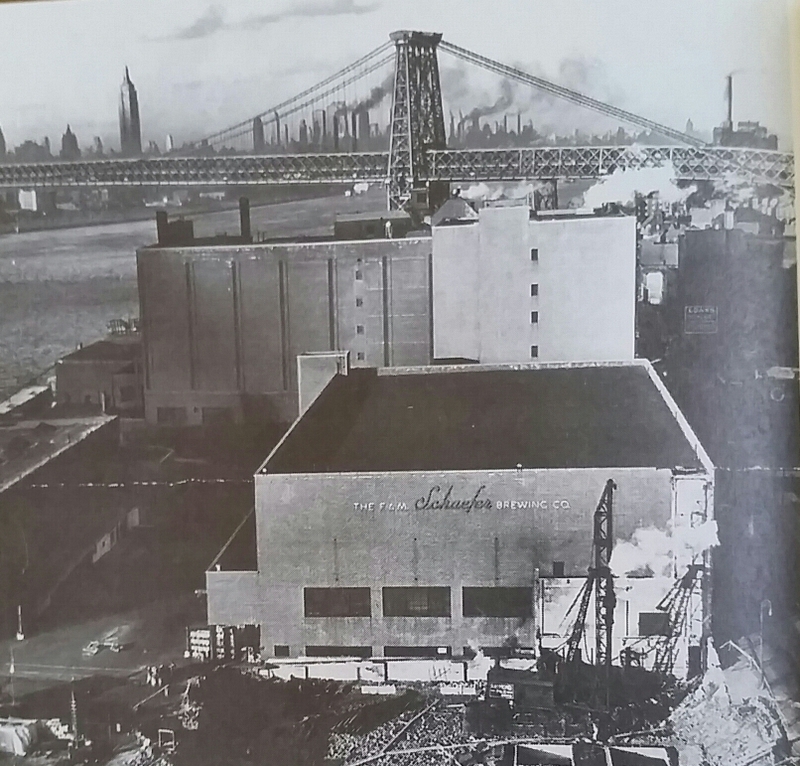 There were German breweries in Williamsburg, like Schaefer Beer. The biggest sugar magnates in Brooklyn, Havemeyer and Mollenhauer, were German. Pfizer Pharmaceuticals was started in Williamsburg in 1849 by German immigrants. on the East River, just south of the Williamsburg Bridge. 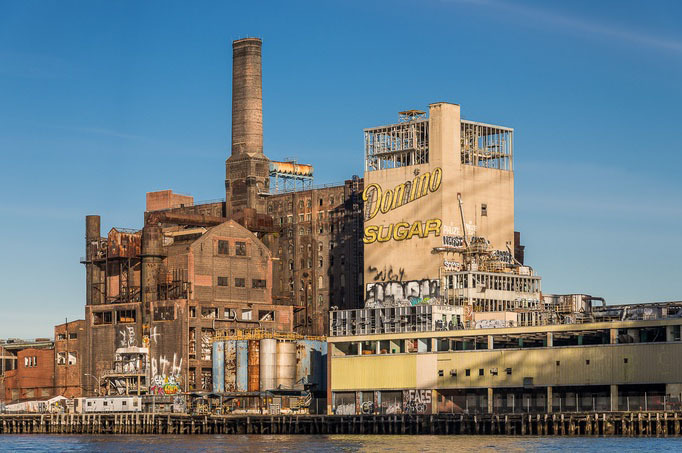 In the late 1800s, more than half the sugar consumed in the U.S. was made in Williamsburg, much of it by Domino Sugar, which was then called American Sugar. 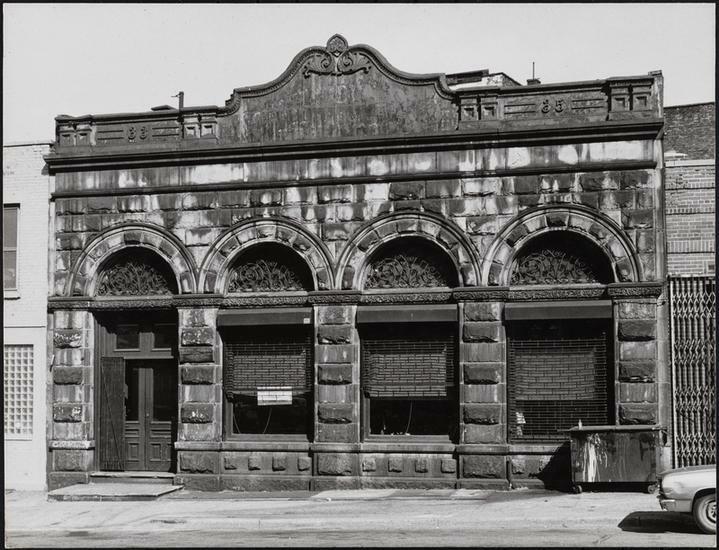 American Sugar was owned by the Havemeyer family, a family of German bakers who had come to New York in 1799. One of the Havemeyers became mayor of New York in 1845. As their wealth grew, the Havemeyers began collecting art. Now the Iglesia Bautista Calvario (Spanish Calvary Baptist Church). “This Romanesque Revival building of red brick and glass blocks features a simple pattern of three soaring recessed arches. 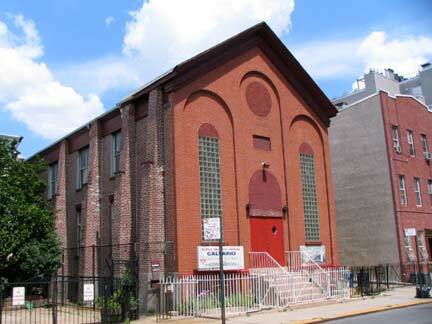 Hard-working brick buttresses flank the sides of this Civil War-era house of worship.” 197-199 North 5th Street. Built in 1889 in the Romanesque style, designed by Theobald Engelhardt. 33-35 Grand Street. On the East River, about five blocks north of the Williamsburg Bridge. The park is named after a ferry that ran from here to Manhattan, before the construction of the Williamsburg Bridge. 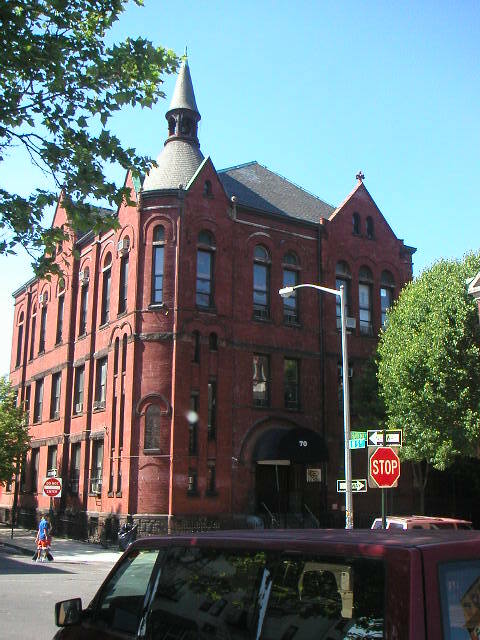 Built in 1884 in the Romanesque style (note all the rounded arches, a Romanesque feature). Kent Ave. and South 4th Street, looking south; in the background is the Williamsburg Bridge. Hungry? Perhaps the oldest and most well-known restaurant in Williamsburg is the Peter Luger Steak House (marked with a green N on my map). Peter Luger “is known for its long wooden bar, and the dining rooms have a Teutonic air, with exposed wooden beams, burnished oak wainscoting, brass chandeliers and weathered beer-hall tables.” If you prefer seafood, consider Frost Restaurant, which offers seafood and Italian food; Frost is far east of where we are now. SEA Restaurant specializes in SouthEastAsian food; it’s near the Bedford Ave. arts district, at 114 North 6th Street. Instead of discussing each point on my map, let’s skip ahead to St. Paul’s Lutheran Church, marked on my map with a blue W. (If you click/touch the pushpins on my map, you’ll find that many provide additional information.) For Lutherans, St. Paul was an especially important figure since he preached salvation through faith, not through obedience to the law; Paul influenced Luther’s doctrine of sola fide, justification by faith alone. St. Paul’s is at 334 South 5th Street, on the southeast corner of South 5th and Rodney, about three blocks east of the Washington statue where we began our tour. Let’s skip ahead again, this time to Holy Trinity, marked on my map with a purple lower-case f.
As St. Paul’s served German Protestants, Holy Trinity served German Catholics. Holy Trinity is about ten blocks east of the statue of Washington, at 138 Montrose Ave., south side, between Manhattan and Graham. 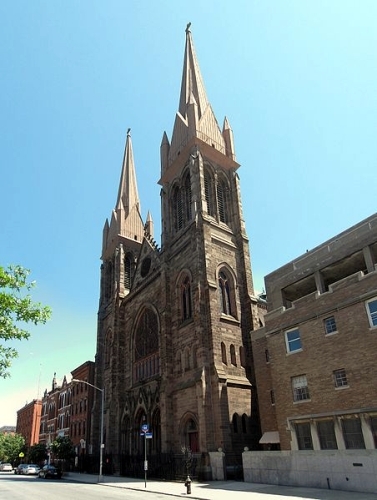 Holy Trinity was built in the 1880s in the French Gothic style. It’s built on a “basilica plan,” it has no transept; in other words, it’s a rectangle, like a loaf of bread, it doesn’t have a cross shape. 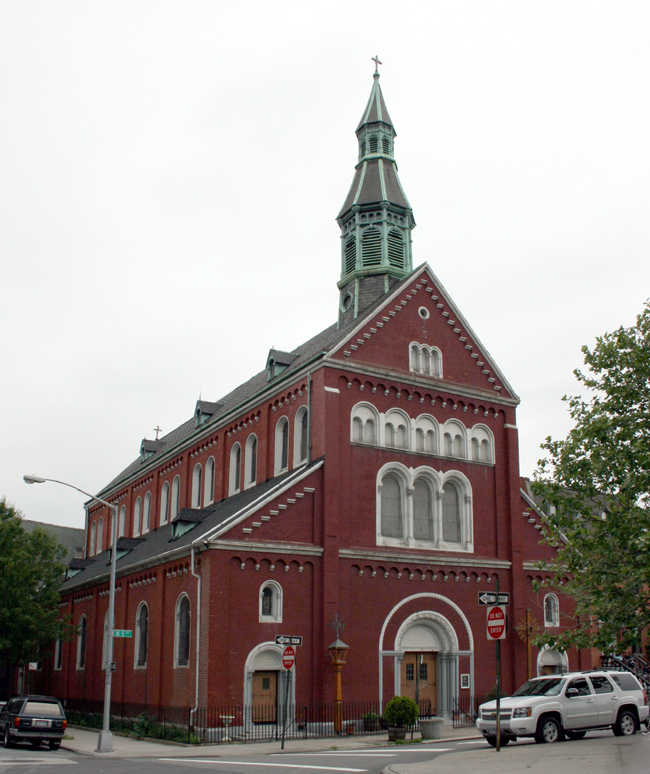 Holy Trinity was built by Williamsburg’s German community. “The stone was imported from Wurzburg, the windows from Innsbruck, and the people mainly from Bavaria and Hesse.”10 Germans came to Williamsburg from the Lower East Side around 1840. Around 1850, German Catholics stationed armed guards around their churches to protect them from anti-Catholic groups such as the “Know-Nothings”. The current church is the third Holy Trinity at this location; the first was built in 1841. Francie thought it was the most beautiful church in Brooklyn. It was made of old gray stone and had twin spires that rose cleanly into the sky, high above the tallest tenements. Inside, the high vaulted ceilings, narrow deepset stained-glass windows and elaborately carved altars made it a miniature cathedral. 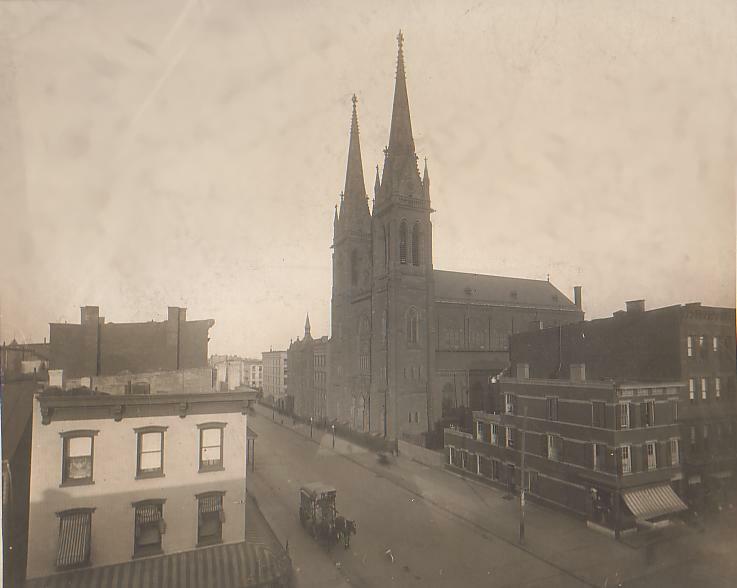 This 1916 photo shows how the church would have looked to Betty Smith. Smith was born into Williamsburg’s German community. She was christened Elisabetha Sophia Wehner in 1896; her parents were Joannes Wehner and Katharina Hommel. people in the mining town helped each other; if a miner was injured, for example, his family received money from a group of other miners. I noticed this also in the Hardy novel that I read recently; before the welfare state, there were various systems for helping those in need. Such systems may have developed a sense of community. The neighborhood became less exclusively German as Italian, Hispanic, Polish and Jewish residents arrived. 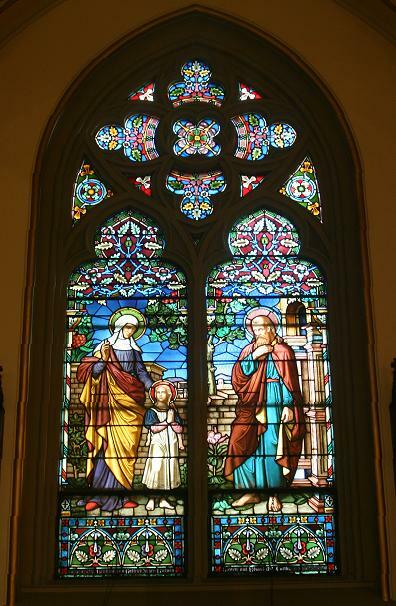 As Most Holy Trinity welcomed a new group of parishioners, it ceased to be a German parish. Many of the old families moved east to Queens and Long Island. Holy Trinity is often said to be haunted. You can reach Williamsburg via a short subway ride from Manhattan, or via the East River Ferry.